The Lion of Upsetting of all Principles (Tattvopaplava-siṃha) by Jayarāśibhaṭṭa has been claimed by some scholars to be the only surviving Cārvāka work. Others have challenged this view.i Since there is no external evidence to settle the question, the debate continues solely on the basis of internal evidence and intrinsic probability. No near-unanimous (total unanimity is seldom found) conclusion has been reached to date. Instead of summarizing the whole debate (which is of a technical nature), a few issues are raised below. They go against branding Jayarāśi a Cārvāka, but identify him rather as a founder/follower of a totally new doctrine, which is quite distinct from both materialism on the one hand and any form of illusionism (māyāvāda) or nihilism (śūnyavāda) on the other. His is ‘the doctrine of upsetting principles,’ tattvopaplava-vāda. This is the name used by Jayarāśi’s critics; nowhere is he called a Cārvāka or ‘one belonging to a section of the Cārvāka’ (Cārvākaikadeśīya).ii It is basically an annihilationist doctrine. Although Jayarāśi is called a skeptic, there is no room for such a thing as doubt in his work. He is convinced that there can be no principles, tattvas, because there is no such thing as pramāṇa. Now, Vātsyāyana in the exordium of his Nyāya Aphorisms (Nyāyasūtra) states at the outset (on 1.1.1) that one has to admit not only pramāṇa, but also the other three, pramātṛ (knower), prameya (the object rightly known), and pramiti (right knowledge of the object): ‘With these four, tattva reaches its fulfillment.’ M.K. Gangopadhyaya suggests that, as opposed to tattvopaplavavāda, Vātsyāyana’s view may be called ‘the doctrine of establishing the principles,’ tattva-vyavasthāpana-vāda.iii It seems Vātsyāyana had a predecessor of Jayarāśi in mind, and against such an opponent he felt it necessary to assert all the four elements stated above. This assertion can be understood only against the backdrop of an opponent who denied pramāṇa as such. The derivation of pākhaṇḍa is of course an instance of folk etymology, but such derivations, however absurd, are pointers to actual usage. Unless pākhaṇḍa was once current in this sense, such a derivation would not be proposed at all. The etymology is required to conform to common understanding, justifying the sense in which it was already in use. Did the Cārvākas or the earlier bhūtavādins and lokāyatas (mentioned in the Tamil epic, Manimekalai, 27.264-277) call themselves bārhaspatyas, thereby giving a stamp of approval to the Purāṇic origin of their philosophical system which in its turn takes its cue from a legend in the Maitrī Upaniṣad (7.9)? No available fragment suggests so. On the other hand, from Purandara we learn that the new materialists used to call themselves Cārvākas and we also know from other sources that the base text of their school was known as the Paurandaraṃ sūtram, and there was also a commentary (an auto-commentary) called Pauraṃdariya vitti as well.xi The very idea of referring to their origin to the suraguru (devaguru) or calling him bhagavān, as found in theTattvopaplava-siṃha, would be anathema to them. i Eli Franco (Perception, Knowledge and Disbelief: A Study of Jayarāśi’s Scepticism (Delhi: MLBD, 1994) )modifies this assertion by calling Jayarāśi a sceptic Lokāyata rather than a materialist (XII-XIII), but very few pay attention to his distinction. They call Jayarāśi a Cārvāka or a Lokāyata, apparently meaning a materialist. ii For instance, Vidyānandasvāmin, Aṣṭasahasrī (Mumbapuri: Nirnayasagara Press, 1915) 37: tadime tattvopaplavavādinaḥ… ; idem,Tattvārthaślokavārttika (Mumbapuri: Nirnayasagara Press ,1918) 80, 195; Anantavīrya, Siddhiviniścayaṭīkā (Kashi: Bharatiya Jnanapith,1959) 277-278 – all treat the Cārvāka and tattvopaplava-vāda separately. – For a survey of the Jayarāśi controversy, see Sukhlalji Sanghvi and Rasiklal Parikh, Introduction to the Tattvopaplavasiṃha of Jayarāśibhaṭṭa (Baroda: Oriental Institute, 1940) i-xiv, reprinted in Cārvāka/Lokāyata (n28 above), 492-504 and Eli Franco (n34 above), XI-XIII, 4-8. For the other view see Walter Ruben (reprinted in Cārvāka/Lokāyata, 505-519), and K. K. Dixit (reprinted in Cārvāka/Lokāyata, 520-530), D. Chattopadhyaya, Indian Philosophy: A Popular Introduction (New Delhi: People’s Publishing House, 1964), 222-223, and In Defence of Materialism in Ancient India (New Delhi: People’s Publishing House, 1989) 36-41. See also R. Bhattacharya in an interview with Krishna Del Toso, “The Wolf’s Footprints: Indian Materialism in perspective,” Annali 71 (2011): 183-204 (particularly 188-191), and Tattvopaplavasiṃha of Jayarāśibhaṭṭa, trans. V. N. Jha (Ernakulam: Chinmaya International Foundation Shodha Sansthan, 2013) xi. iii “Mukhavandha” (Foreword ) to D. K. Mohanta , Tattvopaplavasiṃha: Jayarāśibhaṭṭer Saṃśayavāda ( Kolkata: Sanskrita Sahitya Bhandar, 1998) [xiii]. iv It is also improper to translate nāstika as ‘agnostic’ (as Goldman has done in his translation (The Rāmāyaṇa of Vālmīki, vol. 1, Delhi: Oxford University Press, 1984) 136), for a nāstika in its earliest use is a non-believer in the other-world, later one who denies the authority of the Veda; then one who says there is no god or gods (atheist). In short he or she is a typical neinsager (one who says no). But he or she is neither a doubter nor undecided about acquisition of knowledge as such. See R. Bhattacharya, “Development of Materialism in India: the Pre-Cārvākas and the Cārvākas,” Esercizi Filosofici 8 (2013): 1-12.
v Sanghvi and Parikh (see n34 above) 124; V. N. Jha (n34 above) 464.
vi Indian Philosophy: A Popular Introduction, (see n34 above) 222-23. Even earlier, in two essays in Bangla published in 1963 (see his Saṃghaṃ Śaraṇaṃ Gacchami ityādi agranthita racanā (Kolkata: Ababhas, 2010) 74-84) Chattopadhyaya stated the same point. vii M. K. Gangopadhyaya , “Mukhavandha,” [xi]. viii The Śabda-kalpa-druma (Kalikata: Hitavadi Karyyalaya, 1836 Saka era (1924 CE)) glosses pāṣaṇḍa as one who behaves contrary to the Veda, one who bears all the marks (i.e., a heretic) ; the Buddhists, the Jains and others (some commentators on the lexicons name these two communities in particular); The Sanskrit-Wörterbuch (Eds. O. Böhtlingk and R. Roth (Delhi: MLBD, 1990 reprint)) glosses pāṣaṇḍa as Irrlehre (untaught), Ketzerei (heresy), also Ketzer (heretic). ix D. Chattopadhyaya, Indian Philosophy, 223.
x M. K. Gangopadhyaya, Foreword, [xi]. The etymology of pākhaṇḍa as suggested is found in an anonymous verse quoted in Bhānuji Dīkṣita’s Rāmāśramī (Vyākhyāsudhā), a commentary on the Nāmaliṃgānuśasana (Amarakoṣa) (Varanasi: Chaukhambha Sanskrit Sansthan, Vikrama era 2099), Brahmavarga, 44d. xi R. Bhattacharya, Studies, Chap. 5. Ācāraṅgasūtram and Sūtrakṛtāṅgasūtram with Niryukti of Ācārya Bhadravāhu Svāmī and the Commentary of Śīlāṅkācārya. Ed. Ācārya Sarvanandājī Mahārāja. Re-ed. with Appendix by Muni Jambuvijayaji. Delhi: MLBD Indological Trust, 1978. Anantavīrya, Siddhiviniścayaṭīkā . Kashi: Bharatiya Jnanapith,1959. Bhānuji Dīkṣita. Rāmāśramī (Vyākhyāsudhā), a commentary on the Nāmaliṃgānuśāsana (Amarakoṣa). Varanasi: Chaukhambha Sanskrit Sansthan, Vikrama era 2099. Bhattacharya, Ramkrishna, interview with Krishna Del Toso. “The Wolf’s Footprints: Indian Materialism in perspective.” Annali 71 (2011): 183-204. Bhattacharya, Ramkrishna. “Pre-Cārvāka Materialism in Vasudevahiṃdī.” Jain Journal 43(3) (2009): 102-109. Bhattacharya, Ramkrishna. “Svabhāvavāda and the Cārvāka/Lokāyata: A Historical Overview.” Journal of Indian Philosophy 40(5) (2012): 593-614. Bhattacharya, Ramkrishna. “The Case of Āryabhaṭa and His Detractors.” The Indian Historical Review 17 (1990-91): 35-47. Bhattacharya, Ramkrishna. “The First Cause: Rivals of God in Ancient Indian Thought.” Indian Skeptic 14 (2001a): 19-23. Bhattacharya, Ramkrishna. “The first Cause: Syncretic Bias of Haribhadra and Others.” Jain Journal 35 (3-4) (2001b): 179-184. Bhattacharya, Ramkrishna. “The Social Outlook of the Cārvāka/Lokāyata: A Reconstruction.” Indologica Taurinensia 36 (2010): 37-42. Bhattacharya, Ramkrishna. “Verses Attributed to Bṛhaspati in the Sarvadarśanasaṃgraha: A Critical Appraisal.” Journal of Indian Philosophy 41 (2013): 615-630. Böhtlingk, Otto und Rudolf Roth. Sanskrit-Wörterbuch. Delhi: Motilal Banarsidass, 1990 reprint. Brahmajālasutta. Dīghanikāya. Patna: Pali Publication Board, 1958. Cārvāka/Lokāyata. Eds. D. Chattopadhyaya and M. K. Gangopadhyaya. New Delhi: Indian Council of Philosophical Research, 1990. Chattopadhyaya, Debiprasad. Indian Philosophy: A Popular Introduction. New Delhi: People’s Publishing House, 1965. Chattopadhyaya, Debiprasad. Saṃghaṃ Śaraṇaṃ Gacchami ityādi agranthita racanā. Kolkata: Ababhas, 2010. Cimanabhaṭṭa. Āryavidyāsudhākara. Lahore: Moti Lal Banarsi Das, 1923. Dahlmann, Joseph. Die Sāṃkhya-Philosophie. (Berlin: Felix L. Demes, 1902) qtd. inThe Mahābhārata. Critical Edition. Śāntiparvan. Ed. S. K. Belvalkar. Poona: Bhandarkar Oriental Research Institute, 1951. Del Toso, K., "tebhyaś caitanyaṃ : il 'sé' secondo il Materialismo indiano." In Intrecci filosofici. Pensare il Sé a Oriente e a Occidente, edited by A. Cislaghi and K. Del Toso, pp. 135-153. Milano-Udine: Mimesis, 2012,. Deva, Radhakanta. Śabdakalpa A. Cislaghi and K. Del Toso (ed. ), druma. Kalikata: Hitavadi Karyyalaya, 1836 Saka era (1924 CE). Dharmakīrti, auto-commentary on the Pramāṇa-Vārttika. Ilahabad: Kitab Mahal, 1943. Dixit, K. K. “The Ideological Affiliation of Jayarāśi – The Author of Tattvopaplavasiṃha.” In Cārvāka/Lokāyata, edited by D. Chattopadhyaya and M. K. Gangopadhyaya, pp. 520-530. New Delhi: Indian Council of Philosophical Research, 1990. Franco, Eli. Perception, Knowledge, Disbeilief / A Study on Jayarāśi’s Scepticism. Delhi: Motilal Banarsidass, 1994. Frawallner, Erich. History of Indian Philosophy. Vols. 1 and 2. Delhi: Motilal Banarsidass, 1971. Gangopadhyaya, M. K. Mukhabandha (Foreword) to Dilip Kumar Mohanta. Tattvopaplavasiṃha: Jayarāśibhaṭṭer Saṃśayavāda. Kalikata: Sanskrita Pustak Bhandar, 1998. Gerschhiemer, Gerdi. “Les ‘Six doctrines de spéculation’ (ṣaṭtarkī) – Sur la categorization variable des systems philosophiques dans l’Inde classique.” In Expanding and Merging Horizons.Wilhelm Halbfass Memorial Volume, edited by Karin Preisendanz, pp.239-258. Vienna: Austrian Academy of Sciences Press, 2007. Haribhadra. Ṣaḍdarśanasamuccaya with Guṇaratna’s and Somatilakasῡri’s commentaries and an anonymous Avacῡrṇi. Calcutta: Bharatiya Jnanapitha, 1969. Harvey, Paul. Oxford Companion to Classical Literature. Oxford: Oxford University Press, 1984. Horace. Epistles. London: William Heinemann, 1926. Jayantabhaṭṭa. Nyāyamañjarī. Part 1. Varanasi: Sampurnanand Sanskrit Visvavidyalaya, 1982. Jayarāśibhaṭṭa.Tattvopaplavasiṃha of Jayarāśibhaṭṭa. Baroda: Oriental Institute, 1940. Jayarāśibhaṭṭa. Tattvopaplavasiṃha of Jayarāśibhaṭṭa. Trans. V. N. Jha. Ernakulam: Chinmaya International Foundation Shodha Sansthans, 2013. Jinendrabuddhi.Viśālāmalavatī Pramāṇasamuccayaṭīkā. Eds. Ernst Steinkellner et al. Beijing: China Tibetology Publishing House and Vienna: Austrian Academy of Sciences Press, 2005. Jones, W. H. S. Hippocrates. Vol.1. London: William Heinemann, 1972. Madhusudana Sarasvatī. Prasthānabhedaḥ. Poona: Anandashrama, 1877. Manu-smṛti with Nine Commentaries. Vol. 2. Ed. J. H. Dave. Mumbai: Bharatiya Vidya Bhavan, 1975. Müller, F. Max. Lectures on the Origin and Growth of Religion. London: Longmans, Green & Company, 1891 reprint. Müller, F. Max. The Six Systems of Indian Philosophy (1899). Varanasi: The Chowkhamba Sanskrit Series Office, 1971. Patañjali’s Mahābhāṣya. Paśpaśāhnika. (1972). Ed. with English translation, etc. Kshitish Chandra Chatterji. Calcutta: A. Mukherjee & Co.
Patañjali’s Vyākaraṇa-Mahābhāṣya, Āhnikas 1-3. (1975). Ed. K. V. Abhyankar and Jaydev Mohanlal Shukla. Poona: Bhandarkar Oriental Research Institute. Radhakrishnan, S. and C. A. Moore A Source Book in Indian Philosophy. Princeton: Princeton University Press, . Rāmāyaṇa of Vālmīki,The. Vol. 1, trans. Robert P. Goldman. Delhi: Oxford University Press, 1984. Rhys Davids, T. W. Introduction to the Mahānidānasuttanta. Dialogues of the Buddha. London: Oxford University Press, 1910. Ruben, Walter. 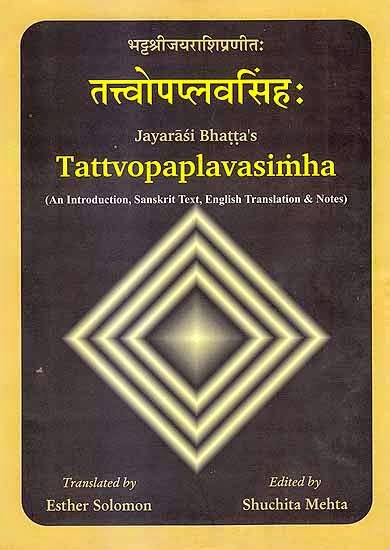 “On the Tattvopaplavasiṃha of Jayarāśibhaṭṭa.” In Cārvāka/Lokāyata, edited by D. Chattopadhyaya and M. K. Gangopadhyaya, pp. 505-519. New Delhi: Indian Council of Philosophical Research, 1990. Sanghvi, Sukhlalji and Rasiklal Parikh. Introduction to the Tattvopaplavasiṃha of Jayarāśibhaṭṭa. Baroda: Oriental Institute, 1940. Reprinted in Cārvāka/Lokāyata, edited by D. Chattopadhyaya and M.K.Gangopadhyaya, pp. 492-504. New Delhi: Indian Council of Philosophical Research, 1990. Gandhinagar: Gujarat Sahitya Akademi, 1989. Śaṅkarācārya. Brahmasūtrabhāṣya. Delhi: Motilal Banarsidass, 1988. Śāntarakṣita. Tattvasaṃgraha with Pañjikā by Kamalaśīla. Varanasi: Bauddha Bharati, 1968, 1981. Sarup, Lakshman (ed.). The Nighaṇṭu and the Nirukta. Delhi: Motilal Banarsidass, 1984. Sastri, T. Ganapati. Arthaśāstra of Kauṭalya with the Śrīmūla Commentary (1924). Dilli: Bharatiya Vidya Prakashan, 1984. Selsam, Howard and Harry Martel. Reader in Marxist Philosophy. New York: International Publishers, 1987.
adhyaya, pp. 394-43. New Delhi: Indian Council of Philosophical Research, 1990. Vidyānandasvāmin. Aṣṭasahasrī. Mumbapuri: Nirnaysagara Press, 1915. Vidyānandasvāmin. Tattvārthaślokavārttika. Mumbapuri: Nirnayasagara Press ,1918. Vyomaśiva. Vyomavatī. Varanasi: Sampurnanand Sanskrit Vishvavidyalaya, 1983-84.